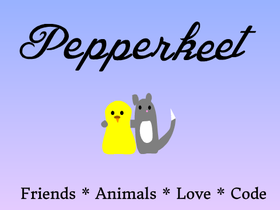 A collaboration of two best friends with a shared love for coding and animals! 100 followers? What? Thanks, guys! We're especially interested in platformers, but are also planning an airplane/driving simulator. @Hotwings6 is our 100th follower! Go follow them!